Like a ballerina in a pirouette, this delicate vase stands with its handles raised and reaching for each other, like graceful, slender arms. 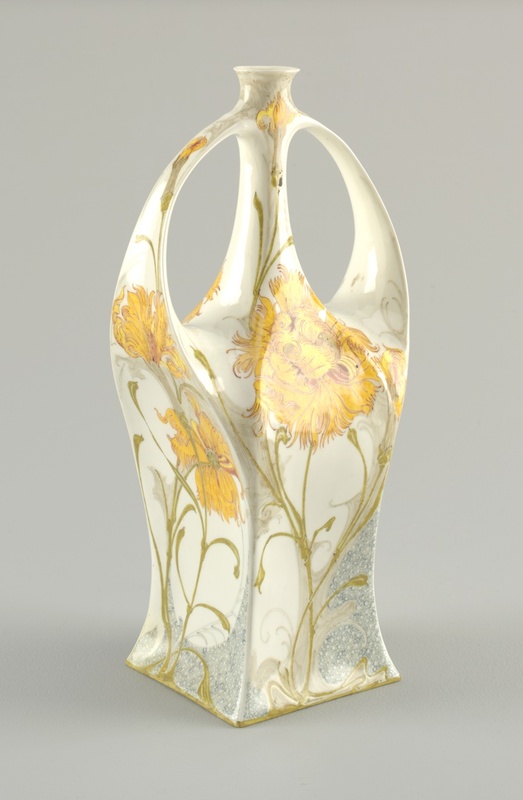 The vase’s sculptural, elongated, and organic form epitomizes Art Nouveau. It is also one for which the Netherlandish Rozenburg Pottery and Porcelain Factory was particularly well known. Rozenburg produced these works of art between 1883 and 1914, and the firm’s works remain highly prized; they can be found in the collections of museums around the world. The vase is made of eggshell-thin porcelain, which has almost the same composition as English bone china. This type of porcelain can be made into very thin-walled flamboyant shapes by means of the slip-casting technique, and displays a highly translucent pale ivory hue. Given these characteristics, “eggshell” porcelain was ideally suited for the boundless expressions of Art Nouveau: organic forms, fluid lines, resistance to predetermined rules, and a fondness for the unusual. The beautiful yellow flowers, painted on the vase by Samuel Schellink, are reminiscent of an Asian pattern. This is not surprising, as Asian art was an important influence and source of inspiration for Art Nouveau designers. Indeed, Siegfried (Samuel) Bing, Arthur Lasenby Liberty (of the Liberty & Co. retail empire), and Louis C. Tiffany (with his famous Favrile glass) were all enthusiasts of Asian art. Wasn’t he named Siegfried Bing? The link to his biography mentions that he is often erroneously referred to as Samuel Bing, yet that is also how he is referenced throughout your website. Why not set the record straight? Vase, 1903; Painted by Samuel Schellink (Danish, 1876-1958); Manufactured by Rozenburg Pottery and Porcelain Factory (The Hague, Netherlands); Painted porcelain; Gift of Arthur Altschul, 1994-117-2.